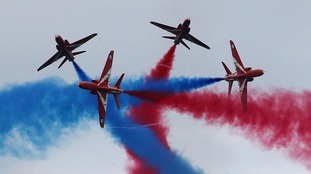 The Red Arrows were the subject of a new Channel 5 documentary, which premiered last night. The six-part series, which followed the world-famous display team since the autumn of 2017, began filming as a new team leader arrived to start work. It shows how he created brand new manoeuvres for the Red Arrows to include in their 2018 displays. The documentary was made by an ITV production company and includes unprecedented behind-the-scenes access. The broadcast comes after a tumultuous year for the squadron, during which it was told its home at RAF Scampton would close and be sold off. Now the team is preparing for its "biggest tour for a generation", as the team's newest pilot, Flt Lt Jon Bond, told ITV Calendar: "It will be another fantastic opportunity to display the best of British overseas." The series continues next Wednesday at 9pm and is available on My5.